The Hangover Part II is a complete carbon copy of its predecessor but still has the the fun and mystery of what happened during the night that they are all f***ed up! Well, surprisingly, The Hangover Part 11 delivered well in living up to its premise on putting together all the clues in finding the lost character after a night of drinking and merriment. Which eventually led to uncertain circumstances and involvements that really added spice to the whole film. This time, after conquering Vegas, they invade Thailand. Its kinda refreshing to know that they have chosen an Asian country as their setting. The epic characters from the Part 1 are still up. And now, with the addition of Teddy's Character who happens to be the brother of Lauren (which is Stu's Fiance), the comeback of Mr. Chow and the special participation of monkey really gave a more or less new and refreshing look of the second franchise. The plot revolved around Stu's wedding in Lauren's native land - Thailand. Lauren is Stu's new girl after a failed relationship as shown in the first film. Of course, who could ever forget the WOLF-PACK (Stu, Alan, Phil and Doug) and now with the addition of Lauren's brother, Teddy who completed the Hangover gang. The Hangover Part 2 brought a lot of cliches from the First film. Actually, its just merely the same aside from its location and series of events that occurred during that night. 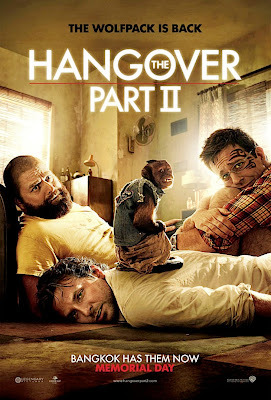 It might feel dejavu on the fans of The Hangover watching this second installment but for me, it brings the same level of fun and excitement as the story progresses. What makes Hangover series appealing is the fact that you wanted to know what happened last night. Aside from finding the lost character, the remaining characters is now caught and in dilemma with circumstances and activities they can't even remember doing because they are all drunk last night. For me, I don't care if they copy the plot on their next franchises, but hey, its the HANGOVER THING that made this film unique and at par to any other films in Hollywood. This time, the whole thing happened in THAILAND. I really commend the Production setting of this film. Aside from it is shot in an Asian Country, it showcased Thailand's culture, people and tourist spots as well. The characters were also great. I so love every attitude of the characters that really blended well in the film's genre and delivery. Of course, I love the character of Alan... a weirdo yet subtle person who just wanted friendship and acceptance. The director really did well in correlating all the characters in terms of emotions and connections with each other. Teddy (the new addition) also gave an average performance, enough to compliment the riot cast. For me, Hangover 2 is good. It is much complicated and suitably funny than the first but it failed to give excitement. For fans, they'll be more or less disappointed to the second franchise but for first timers, they would be pleased. however, expect lots of surprises and revelations in Hangover Part II. And who could ever forget the epic ending of the first... The closing credits turned slideshow presentation of all their pictures during the time that they were all f***ed up! Don't worry! You'll get another dosage of it on Hangover Part II. whew mike! never thought youd be somebody who would watch The Hangover.. You sure have lots of surprises. You are very articulate in your as a critique. Great job! Will be following for more of your posts. :) mwaaah! whew! Thanks sa comment Glo! Really appreciated such! Yup, aside from being a Horror-fanatic, I also love Comedy Films. More Reviews to come. Take care!